Rub the teapots- and what will happen? I hope that 2008 will be happy safe and peaceful for all of you. I hope that it will bring good things for you and that your dreams may come true. As for my kids and myself- well I certainly hope 2008 will be an improvement on 2007- because this last year has been the pits. On a work basis I will be preparing for my exhibition in Munich at Textil und Kunst and I had another play with the teapot lino-cut/transfer- this is getting more like I wanted them to look, although there will be all sorts of variations. In all likelihood I will not enter many exhibitions/competitions because my primary focus will be getting work ready for my exhibition. I will be travelling to Europe from the end of August, giving a class in Brugge for a group of textile travellers and then going onto Munich to teach there and then onto Val d'Argent and other places. I shall be in Europe until early October.Otherwise I will be her ein Australia and hoping to organise a few classes in Gellibrand. I hope to build a house on the other block where the kids and I can live, but if all else fails I will have to find somewhere else to live. Good job I finished weeding a large part of the vegie garden and mulched it early this morning because it turned into a scorcher. We went to Geelong yesterday to look at project homes - as I need to build a house on the other block soon- the prices of homes is rather horrific.I need to get my life sorted and know where I am at. I am afraid the last couple of months have not see me complete any substantial work and I really need to do so, plus I need to sell some larger work. I have to rephotograph everything that I have here, that is for sale. I left a lot of my work in Europe on my last trip, it seemed senseless lugging it back and forth. Coral Variation #22 done! The background fabric is hand printed overlaid with transfer painted and printed lutradur and machine stitched. It measures 22 cm square and fits into a 23 xcom square Ikea frame. it is for sale for $50Us inclusive of postage. I always think noughts and crosses is the wrong name for the game and that really it should be called hugs and kisses as so many people sign their letters and cards with noughts and crosses. So this is my attempt to make a noughts and crosses quiltlet ( not very arty I know- just a bit of fun as Peter says in Finding Neverland). I wanted to use up the cd's that i had wrapped and tied in fabric last year for the Sense of Place exhibition. I decided to make the background in a grid- I just fused the orange lines into place and sewed them down, then quilted the background fabric ( which is a bit darker than in the photo) with writing saying hugs and kisses. I then fused the signs on the cd's, but will also attach them with stitching and on the back I will place some velcro so they can be moved around to play an actual game.Anyway it did use up all those dead cd's.I started it earlier this year but as I always try and finish what I start I decided to finish making this little piece whilst watching the cricket. The weather is turning very warm and I will have to get into the garden and mulch tomorrow after weeding- the weeds grow too fast! And my Neon site counter is so close to 100,000- amazing, but my sitemeter counter is inching towards 150,000. I am just amazed that so many people visit. Thank you each and every one! Neon is up to 138 countries ( not including Lebanon which Neon doesn't want to recognise but from where I have a regular visitor)- so when Sitemeter reaches that magical figure I shall have to think of a gift for that reader! I worked on Coral Variation #21 today. It is for sale for $50US inclusive of postage. I think I will try and do one a day util I reach the magic number 50 of the limited edition. Shirley asked about Khadi journals and I photographed one- they are made from rag papers- so very strong and can very easily be sewn. I like them as I like to sew both by hand and machine on the papers and I may end up using them for my catalogue project for my exhibition. in Australia they are available from the Thread Studio. Now I am off to prepare the food for festivities- we have decided on a spanish theme- so I need to prepare some tapas, some tortilla ( and all this was decided before I got the cookbook), a big pan of paella ( unfortunately we could not find any mussels)- we have the music all ready- flamenco, Gypsy Kings, and Bueno Vista Social Club for after dinner mellow- I have to find my lace mantilla I made in the beginning of the lace making saga- we intend to celebrate in character! I am still mucking around trying to get what i want to do with the teapots right. I need to find my soldering iron- which seems to have disappeared in the shed that is supposed to be my studio. I will have a bigger search tomorrow- it will be somewhere. I think it would look good to take away some of the background lutradur with just spots of melting. We have had a lot of rain in the last 24 hours- I was a bit worried that the summer palace ( aka tent where I am sleeping ) might flood last night. Althought this rain is great for the garden, which now also desperately needs to be weeded, because unfortunately the weeds seem to grow faster than the vegies. I have been trying to get a hold of some mulch, but as the farmers have those huge rolls of hay, that look wonderful, I am afraid that they would not fit in my Nissan Micra , and the car would disappear in the roll if it were placed on the roof- mobile hay roll- so I am trying to find good old fashioned oblong hay bales that even I can lift!. I will have to do something about the car situation as I will no longer be able to use the station wagon - so I will have to probably get another car along with the mortgage, although I do like small cars, but if I teach there is always so much gear to carry, let alone the kids and their gear! I did get a lovely parcel from the Thread Studio- Khadi journals which I love and some orange/red threads- but also a lovely gift of hand dyed sewing threads, decorative wire and a few other odds and bits- thanks Dale! Chug chug chug- still working on the coral variations and am almost halfway. Of course they are for sale for $50 US each including postage. Just email me if you are interested. The background cloth in #19 is actually orange but is showing up as pink- I think it must be the touch of white in the printed fabric that is causing that. It has also been a good way to use up bits of fabric that weren't big enough to do anything much with but that were too nice to part with. The two background fabrics in this are prints that didn't really work on their own but they are fine if used it his way. Thank you for the feedbag on the teapots- sometimes you are so on top of the work you are not sure if it has really worked or not, so it is always good to get feedback. I think I will make a series of three with maybe 20 little squares in each series rather than 64 of the one imprint. As part of an end of year round up ( and one positive thing that has happened recently is that my middle daughter came home for one night- after refusing to come home or see us for 14 months- it is small steps but at least it is so much more hopeful than the bleakness of the last year, and I can see a little spring in my touch with my work) I thought I would share some of my favourite blogs with you- ones that I read regularly and always draw inspiration from. They are in no particular order, and whilst I mention these blogs in particular, I hasten to add that I regularly look at all the blogs in my sidebar and derive a great deal of enjoyment from them- but I have chosen these because they are thoughful and always offer something new in making or thought process or simpy in inspiration and they blog regularly. Jude's blog- Spirit Cloth- her work is so different than mine, yet I really relate to her thoughtfulness in regard to process. I feel much the same about cloth and the way things come togehter, despite the fact that I often work with a machine- but it is the whole colouring of cloth- creating the visual and textural surface. Olga Norris' blog Threading Thoughts Olga's work is an inspiration of the effectiveness of stitch combined with personal imagery- I also enjoy reviews of exhibitions Olga has seen, and which I wish I had, and also her reviews of books- many of which have been placed on my wish list! 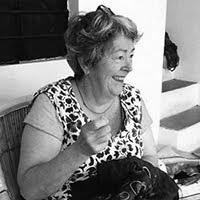 And last but not least is Sharon Bogon's blog In a Mintue Ago- it is a wonderful archive of any information textile. stitch or embroidery plus Sharon has really inspired stitchers worldwide to take their stitching further! Thinking about the word caravanserai, has got me all enthused and suddenly I can see lots of ideas and ways of bringing those ideas to textile form. I must admit I was a bit blocked even though I was doing the Coral Variations, and got a wee bit on the panicky side as I really do have to make a lot of work for my exhibition next year. Of course a big element of the caravanserai ambience would have been the drinking of tea- and indeed every where you go in Syria there is some method of brewing tea. Tea is also a hospitable activity - it is the means by which you talk to your neightbours and share the news and the stories. When I was in Damascus I thought long and hard about buying a Syrian teapot and decided against it, as I thought it somehow would not suit here and now, and of course now I am regretting it. I trawled through all my photos and found one of a window of an antique shop and voila lots of intersting shaped teapots. So these pieces will be the beginning of the exhibition- the sharing of a story over tea with my friends and neighbours and viewers. I will make a series of 64 ( well that is the current thinking- it may change depending how I go time wise). I made a lino cut of some of the interstingly shaped teapots, and then transferred it onto paper and lutradur to make this little textile piece- which measures 8 inches square. This is a prototype as I still want to play around a little with cutting away and texture, but it filled my day. Does it feel like an invitation to you? My youngest daughter went to camp earlier this week to Canberra and she came home with a really cool kaleidoscope. We have been mucking around taking photos on the macro function of my digital camera down the eye hole of the kaleidoscope. I love the way they look like constellations or galaxies. I had intended to make more coral variations but instead spent most of the day collating images from Syria and working on the idea of caravanserai- which has given me more ideas than using the word Syria. 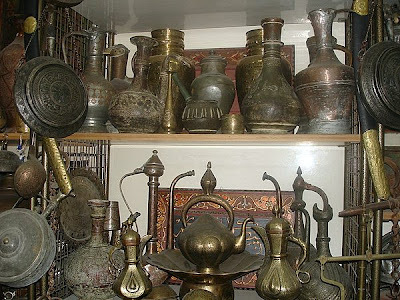 I think I like the ideas of travel, exchange, spices, textiles, tents and bringing tales of strange places that the word carvanserai conjures up. Also the colours of the traveling caravans- of rich and ethnic textiles . Both Coral varations #17 and #18 are sold! I finished yesterdays Coral Variation 17. I am always surprised how different they look with the satin stitching- it really sets them off and is an important lesson in paying good attention to any binding you might put on a quilt. The red/orange piece is Variation 18.Of course they are for sale for $50US inclusive of postage. They measure 8 3/4 incehs square and the other day when I was at Ikea in Melbourne I found the perfect sized shadow box for them which I will try and show tomorrow. Thanks to Soul at Play for the websites referring to cob building and green building. I have looked at this sort of thing before, and cob building would work well here as we have clay soil but I don't think I have enough time to do it or the skills. I suppose I could always learn but then I don't think there would be much time left for creating anything. I really have to get into creating work for my exhibition next year which I am thinking of calling Caravanserai, which gives me some imaginative scope for creating the catalogue I have been talking about- it allows more tangents and explorations. What image comes to yoru mind when you hear the word "caravanserai"? I have tried to work since being back from Melbourne, but life keeps on intervening so it has been slow going. I did buy some more screen printing supplies to do more break down printing when I was in Melbourne, and some more dyes to make sure I don't run out over summer. Now I have to order some more fabric and then I am set to do a dye run if anyone is interested in buying any fabric? Doing anything outside at the moment is inviting fly feasting- they are so sticky and numerous at the moment! In the early mornings I have to water the vegie garden which is finally coming along- ridiculous amounts of tomatoes planted and all sorts of other stuff, but I love eating out of the garden and i look longingly for that first tomato. I have also been looking at house plans and prices- as I want a house built on the other block- I must admit the prices have me hyperventilating a bit- actually a lot, so anyone who can share experiences or other information- I would gladly receive it. I have also been working on my resume- it is slowly getting there. I am going away for a day or two with my eldest daughter and boyfriend and believe it or not my middle daughter. I thought it was best that the reunion be on neutral ground whilst doing some other things like movies, shops and galleries. I have also been tinkering with the Otway water blog and have actually changed the address ( one letter less) It is my intention, now that it is up and running to post more photos and stories and information about our region so that it becomes a resource in its own right.It will be made up of many voices. I have posted a photo of the hill behind our house because it always looks different and in the early morning it often has a cloudy dress. This makes the evenings, when the weather is hot hot hot bearable- a cool descends in our valley which even results in condensation even in summer, and the brilliant southern night skies is like a canopy oftwinkling little lights- orions belt, the southern cross- I love it all. I have been making some more cats-I just needed to sit and do some hand sewing. I have also been working on my resume- it takes a lot of time- I have never been so conscious of chosing the right words that describe what i do. Shirley asked if I was stitching over the same lines in the gypsy pieces several times. The answer is yes but I also double thread the top of the machine whenever I can- two threads one needle- it creates amuch thicker line and also I can use two slightly different colouts which gives a nice play of colour in the stitched line. it does create a bit of havoc with tension sometimes, but as I am not a perfectionist about the backs of anything I do, I just wear that! I have been seriously sewing, but got a bit bored doing the coral variations, so decided to make some collages from scraps of hand-dyed and printed fabrics. I always keep the red/orange and dark scraps. These collages remind of a gypsy dance- rich and lively- duende- flamenco. They are for sale at %50US each ( and are about 22cm square- or b 1/2 inches). The price does include postage. And then I decided to do some more coral variations so these are #15 and #16. The price is the same as the Gypsy Moments. Another day; another coral variation.This one is quite intensely coloured. Thank you all for your kind words and thoughts. I know things could be much worse, but on the other hand I do hope things will improve from here because the last year is one I would much rather forget. And sometimes it is hard to see good things in all that's gone on. Most of what has happened is in my personal life, but my professional life seesm to have gone on despite it all and despite my barely hanging in there at times. All in all when I look at what sort of quilt year it has been it's actually been better than I thought. I went to Syria and France with the Sense of Place Exhibition which opened at a Yarra Valley vineyard in January of 2007.The exhibition got lots of positive comment and feedback and we sold quite a bit of work from the exhibition in France. I got invited to exhibit in Munich next year at Textil und Kunst. Across Australia was shown in Australian venues, my book continued to sell well and I got a contract with Editions de Saxe- the Magic Patch people. I taught at Val D'Argent with full classes for 3 of the 4 days and I got invited to be part of an exhibition entitled Pierre organised by the Atelier of Genevieve Verriere an art quilt group from near le Mans. I did quite a lot of teaching around Europe, though I scarcely did any in Australia though I continue to get weekly emails from people asking when and where am I teaching in Australia. Other things are afoot for 2008 if I can manage to stay with the game.Oh and I am still writing the lutradur book with Marion Barnett- honest! So my plan- is anyone interested in doing one or two weekend workshops in Gellibrand in Janauary? We have a good caravan park- there is room to pitch a tent here if necessary, and the nature is beautiful! As I said I intend to make 50 coral variations because they are in essence editions as they are lino printed. They are for sale for $50 US each, inclusive of postage. I have over the years belonged to a number of lists, and I often hear the comments that people aren't interested in the personal chatter and they just want to hear about techniques and see techniques. I for one enjoy getting to know people better not only through their work but the trials and tribulations of how life affects their art output and focus ( I also enjoy reading biographies of artists ,and have learnt a lot about dedication and adhesion to principles and vision when often the art community ran completely counter and were often critical and often in the face of financial hardship). I started life is a fulltime textile artist in 1993 , though I had always had something textile in my hands. At that time I had two little kids- and would often put the play pen in my work room- not for them ,but I would put myself and my machine in the playpen so they could rummage through all the fabrics in the room where I worked. Then I did a small business course and shortly thereafter had another child- three kids under 5. I kept going though, even though sometimes I was flat out getting a days work done in a whole week. Then we moved to the country- I was worried my fledgeling business would not survive-it did, but gradually making of quilts started taking over form filler business activities especially as kids started school. I always worked from home. When my youngest reached school age we went to France for 3 months and lived in a castle and as people in Europe got to know me more I started getting more teaching, and was fortunate to have several magazines do write-ups about my work. However all this takes a toll, and my husband and I have decided to split up, amicably. I am not sure how this will impact on my work. I shall have to go negotiate a loan so that I can put a house on the other block so that I can live there with my children. I may have to get a real time job to get that loan- though that might be difficult- it is nearly 20 years since I practised law, and what skills do I really have for out there, apart from those I use already and with which I don't earn enough to support my family in Australia ( that's why I teach overseas)- or I need to sell a load of my work and write another book. Something will happen it always does, and I hope I can continue on with my work- others have done it, so surely so can i.
I coloured some more lutradur and printed it with the coral linocut. Not the best of jobs on a hot day as you heat transfer the papers onto the lutradur and for some reason I get much better colour with my iron than with the heat press. I also made another coral variation - and yep it's for sale! Plus I photographed a whole lot of them together and it is very tempting to make a really big piece like this- I like how they look together. I have to think of a Syrian themed pattern that I can make into a linocut and then I can use it for my exhibition in Munich next year- it certainly has that jewel/rich quality about it- souq impressions? The first two Coral variations from yesterdays post have been sold! I only made one today (and it is for sale for $50US inclusive of postage) as I had to take my machine to Geelong to have it looked at as it has a problem that rarely arises with a Designer II. It looks as if the problem may arise from my moving the fabric a lot when free machining therefore creating static in the lower part of the machine/bobbin case and that somehow shortcircuits the computer brain.So I guess I should take my own advise to students and take more frequent breaks! I had also broken my spring loaded machine foot- having sheared through the metal bar that sits on top of the needle screw- also likely to have occurred due to frequent use. I did find however that I can bring home the machine I won at Carrefour Europeen du Patchwork in September as the transformer will deal with our power. I had tried to sell it, but the person who was intereted really wanted to pay too little as far as I was concerned- I was happy to win it and that does not mean I am going to give it away.It is a Husqvarna Sapphire in case anyone in Europe is interested- the new machine with sensor foot and wider neck. I did some more breakdown printing- the first photo shows the painted screen- then the breakdown printing - it looked too white so I over painted it with dye.